RifleGear Exclusives are ideal if you're seeking a custom turnkey rifle setup or an upper receiver build. We've selected some of the industry's most trusted brands to offer packages at a competitive price point. RifleGear built 18" upper assembly. Built off a BCM Mil-Spec forged upper receiver, BCM M16 Bolt Carrier Group, FN Cold Hammer Forged 18" Rifle-Length barrel, BCM MCMR MLOK Rail, BCM 3x3 Ambi Charging Handle and RifleGear Tater Brake. This upper is fully functioning and ready to be attached to your AR15 lower. 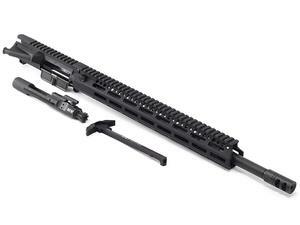 BCM 5-Slot nylon MLOK rail section and QD sling mount included.